A cup of espresso can evoke the mood in the morning, and delicious espresso is born from the best machine. But, the best espresso maker has many things to consider, of course, everyone has their own tastes and prices in accordance with the available budget. Then, what are the best espresso makers worth buying in 2018? Let’s check them out! Check our recommendations for the best tactical flashlight! If you love enjoying a good cup of espresso, but refuse to visit the coffee shop every day, buying the best espresso makers 2018 is a good investment. Many espresso makers now have enough options to customize your specific drink, but still easy enough for casual espresso drinkers. Mr. Coffee BVMC-ECMP 1000-RB (Café Barista) is a practical espresso maker, which gives enough custom options to make exceptional coffee beverages. Mr. Coffee is a coffee maker that makes three types of drink: espresso, latte, and cappuccino. This espresso maker has an easy control panel, with three buttons to easily switch between drink types. There are also options for single-shot and double-shot espresso. The espresso machine has 15-pressure bars of an electric pump, ensuring precise measurement to create your specific coffee beverage. Automatic milk frother will create proper milk froth for each beverage type, removing the guesswork. Mr. Coffee has two removable liquid reservoirs, each for milk and water. The straightforward interface of Café Barista’s control panel allows you to switch between single-shot and double-shot, or different beverage types, with just one touch to each button. The liquid reservoirs in Mr. Coffee Café Barista are spacious and removable, making it easy to refill and clean them. You also have more freedom to mix the milk with additional condiments, such as cinnamon and nutmeg. Mr. Coffee Café Barista produces good coffee you can find at coffee shops, with true crema that makes every cup look like something from a fancy café. Mr. Coffee Café Barista’s automatic setting for beverages makes it difficult to adjust personal preference. If you love the specific amount of milk in your cappuccino or latte, it may be hard to get that particular preference with the fixed setting. The shots made by this espresso machine are quite small. If you prefer double shots for all your coffee beverages, you risk getting smaller coffee punch than you have intended. Mr. Coffee Café Barista makes a lot of milk froth, which can cause spillover when you cannot find the right cup size for the cappuccino. Mr. Coffee Café Barista is perfect for home baristas who already have basic experiences in the making latte and espresso, but still, love a quick and practical way to make coffee. Since this espresso machine is from the affordable range, it is perfect for anyone who wants to have café-style beverages at home. Mr. Coffee BVMC-ECMP 1000-RB (Café Barista) is one of the best espresso makers 2018. 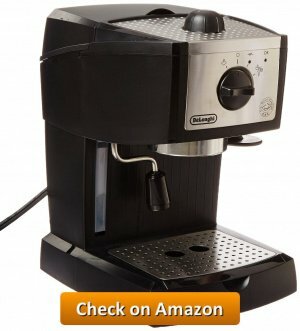 Try this espresso machine if you want quick but delicious coffee beverages at home. The dedicated coffee lovers prefer freedom when making espresso, even with a machine. Breville BES870XL Barista Express is one of the top espresso makers 2018 that all gourmet coffee drinkers must have. It has an ergonomic but luxurious design, with features to adjust your own espresso preferences. Breville Barista Express is a great machine to enjoy gourmet coffee drinks in no time. Breville Barista Express has an installed conical burr grinder with adjustable setting. A coffee hopper is installed to store and transfer coffee easily. The grinder has one-button operation system to adjust texture and volume. Breville Barista Express has water distribution system that consists of a flat shower and pre-brew function, which make sure that proper amount of water flowing through the coffee puck. The “Clean Me Light” feature informs the coffee owner to clean the machine. The feature is on whenever the machine reaches its cleaning cycle period. The coffee machine has removable water container for easier pouring and cleaning. The top part has a filter to remove impurities and improve the coffee flavor. Breville Barista Express has stainless steel coated with anti-slip feet, preventing the machine to move around when you grind coffee beans. Removable drip tray catches wet and dry residues from the coffee-making process. Adjusting coffee bean’s coarseness level is easier with a user-friendly control panel. You can make coarse or fine coffee powder by just touching a button. This machine produces espresso that has thicker cream (coffee foam that is formed on the surface). It is perfect for espresso lover who does not want to go to the coffee shop every day. Breville Barista Express has several “smart” features that make brewing espresso easier. These features include a heating system with automatic water temperature control, 360-degree milk texturing swivel, the grinder that stops automatically, and hands-free coffee powder dispenser. This espresso machine comes with a cleaning kit and guide. It also has an automatic indicator that tells you when to clean the machine. You can better maintain this coffee machine condition thanks to the regular cleaning schedule. This coffee machine is semi-automatic, so expect some dry mess from coffee beans after the grinding process. The grinding setting has been set in fixed options. You get options from fine to coarse, but you cannot experiment to get more specific coarseness level. 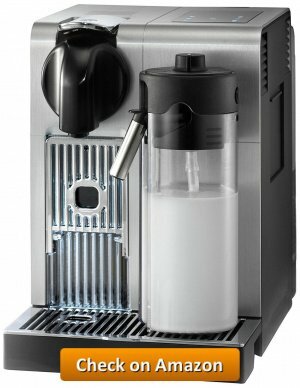 This semi-automatic coffee machine has sleek stainless-steel coat, but plastic elements on the top and bottom sides make it look cheap. Breville BES870XL Barista Express is perfect for coffee lovers who love quick espresso at home, but still want to experiment. It is also useful for coffee drinkers who already have the basic skill of making proper espresso. If you are looking for top espresso maker 2018 that allows experiments, Breville BES870XL is an excellent choice. A semi-automatic espresso machine releases practical coffee drinkers from troubles, but still gives opportunities to experiment. Breville BES840CBXL Infuser Espresso Machine is one of the best semi-automatic espresso makers 2018. It is easy to operate, but you still have the freedom to mix and match until you find your own great espresso. Breville Infuser also offers slow extraction mode for the best espresso flavor. Breville Infuser Espresso Machine provides slow extraction method for the espresso ground. The first slow extraction bursts all the imperfections and irregularities in the grains. This helps the espresso ground to release its maximum flavor when the high pressure is applied. The espresso machine has easy volume control with just one button. There are manual and automatic options for a one-shot, double-shot, and customized shot. The manual steam wand can swivel in 360 degrees and adjust the volume of milk froth for your espresso or latte. Breville Infuser Espresso Machine can enter Sleep Mode automatically after being unused for one hour. When it keeps being unused for three hours, the machine will shut down. Many semi-automatic coffee machines cannot extract espresso grains in maximum capacity, especially if the coffee ground has impurities. Slow extraction function will create deeper espresso flavor, creating a better coffee beverage. You can use a lot of automatic functions in the espresso machine to make a quick cup of coffee, including simple Americano. However, there are also options to adjust your own recipe. Breville Infuser Espresso Machine has an instant hot water container, high cup clearance for a big mug or tumbler, and automatic Sleep/Shut Down functions. They are perfect for coffee lovers who are very busy and often in a hurry. Despite being a premium-class semi-automatic espresso machine, Breville Infuser Espresso Machine has slightly loud sound when it is run. This espresso machine does not come with an installed grinder, making it troublesome for the most practical users. The energy-saving feature of this espresso machine prevents the espresso cups from staying warm. You can reduce the amount of cream if you do not drink the coffee immediately. Breville BES840CBXL Infuser Espresso Machine is perfect for coffee lovers who love deeper flavor than other similar machines, but still, have automatic features to cut the time needed for a cup of coffee. Coffee lovers with slightly higher barista skill can adjust their own ingredients and methods. You need to invest in a good grinder to use this machine in the best way. Enjoying a good cup of espresso at home is now possible with a machine that has deep flavor extraction function. Breville BES840CBXL Infuser Espresso Machine is one of the best semi-automatic espresso makers 2018 to make high-quality coffee. An espresso machine is often not quick enough, especially if you must wait to get the right temperature. De’ Longhi EC155 15 BAR is one of the best espresso machines 2018 for fast coffee-making, without sacrificing flavor. Here are reasons why you need to add this espresso machine to your kitchen. De’ Longhi EC155 has separate thermostats for the water and coffee, which help users to adjust the perfect temperature for ideal coffee beverages. Users do not need to wait for the boiler to reach the right temperature. De’ Longhi EC155 has a self-priming function for quicker preparation. Milk frothing spout is located on the side, next to the cup tray. You can adjust the amount and texture of the milk froth as you like. The machine has the special coffee ground holders to create one or two-shot espresso. There is also a slot to brew an espresso pod. De’ Longhi EC155 has a removable water tank with handle and located on the top. It is easy to draw, clean, refill, and place the water tank back. The 15-bar manual pump helps to extract the coffee grounds to the maximum level, creating high-quality coffee drinks. With these features, you can make espresso, latte, or cappuccino anytime without problems. The espresso machine’s self-priming prep helps you making a quick cup of espresso, latte, or cappuccino, without reducing the flavor because of low temperature. Perfect for busy people who need quick coffee before depart. All parts of De’ Longhi EC155 are easy to remove and clean, including the ones that are getting dirty quickly, such as the tray and water tank. 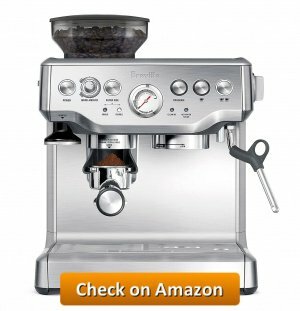 If you are not a home barista-type, and only need properly good coffee for a quick caffeine fix, this machine is perfect. The control and operation are easy, but you still get good coffee results. Some users have complained that this espresso machine has a quite noisy steamer. The engine sometimes shakes hard, especially if it has been used for more than a few years. This espresso machine has just enough space to place espresso demitasse or small coffee cup, but not enough for the larger mug or a tumbler. The position of the milk frothing wand is too close to the ground, which can cause a spill if you tilt your cup after pouring the milk. De’ Longhi EC155 15 BAR is perfect for the casual coffee drinker who needs proper coffee quickly and has no trouble with the small coffee cup. It is also great for those who have tiny space in the kitchen or office pantry. De’ Longhi EC155 is one of the best espresso machines 2018 for quick but delicious espresso, latte, and cappuccino. Need a compact coffee machine just for your home café experience? BELLA Personal Espresso Maker is probably one of the best express espresso machines 2018 designed for practicality. The compact design, easy operation, and glass decanter help anyone making café-style coffee drinks at home. BELLA has a compact design that fits in narrow countertop or pantry table. The espresso machine is just 750 watts, making it perfect for any house, apartment, or small office that cannot handle appliances with big wattage. This espresso machine has a knob for automatic brewing. Once the right amount of coffee ground is put in the filter, it is ready for quick brewing. The espresso machine comes with detachable filter and coffee ground scoop. The filter has safety cap to prevent the coffee from spilling out. Meanwhile, the scoop has the right size to make various coffee recipes, from espresso to cappuccino. The compact espresso machine has automatic steaming and frothing wand for milk. It is located on the right-hand side of the machine. The coffee machine comes with a glass decanter. It is equipped with a little spout and measurement lines, making it easier to create various coffee beverages in no time. BELLA Personal Espresso Maker’s features are great to make quick coffee with café beverage-like flavor. This espresso maker is perfect for singles, anyone who only needs to make a little coffee every day, students, and such. The small, sleek design and low wattage make this machine great for small kitchen or home. The machine offers quite quick brewing for an affordable machine. 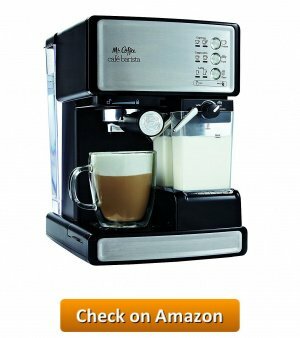 You can make espresso, latte, cappuccino, macchiato, almond coffee, Americano, and much more with ease. Despite the size, this espresso maker has quite decent pressure system, which is 5-bar. This means you can get a quite good espresso extraction, flavor, and crema. Unlike many high-end coffee makers, BELLA does not have automatic shut-off function. This means you cannot forget to turn off the machine when it is on. Most of the material in this espresso maker is plastic. If you look for a premium-looking machine, this is definitely not for you. This espresso maker does not have a grinder, and its coffee basket has a limited amount of space. It is hard to experiment with various concoctions until you find your own coffee ingredient. BELLA Personal Espresso Maker is perfect for anyone who just wants a quick cup of coffee for themselves every day, without complicated steps. This coffee maker is also great for a room or office that cannot handle appliances with big wattage. BELLA Personal Espresso Maker may look small, but this is one of the best express espresso makers 2018 if you search for price and convenience. Are you ready for the latest espresso machine product? It’s time to uncover the DeLonghi ESAM3300 Magnifica, one of the best espresso markers 2018. The steam-powered device is totally extraordinary. With its power output of 1150 watts, your coffee making is super-efficient. Not only is it durable but also fashionable. Out of the top espresso markers 2018, DeLonghi ESAM3300 Magnifica has features that blow anyone’s mind. The cappuccino system with an angle of 180 degrees, wholly patented, enables the user to set the milk container varied in size on the machine’s slot freely. Additionally, the coffee spigot fitting for cups of any size is easily adjusted. Magnifica has the beans-to-brew system making the aroma of your just made espresso, as well as taste, so awesome. The coffee beans newly ground could be sensed throughout your mouth. For a balanced, not bitter drink creation, simply add the Italian coffee—the Illy. Interestingly, the very-automatic coffee machine boasts an integrated burr grinder that automatically crushes the beans. You are free to organize the grinding level as you want. This effective espresso machine comes with a front panel, easily controllable—there is no such trouble ahead regarding on and off switch system. In addition to that, running the control allows you to tailor the amount of coffee and water as well. It’s basically up to you when it comes to adjusting the preferred taste. Speaking of the Magnifica’s brewing unit, it features undersized brewing systems which you can easily remove. What about the boiler? It surprisingly owns an amazing heat distribution system with a great temperature setting, retaining the finest quality of your tasty espresso. Washing up the machine’s inner has never been tough; you obviously get assistance from the fused boiler removable. Clear out your worry of being unable to reach the deeper areas—everything seems trouble-free even without the detergent. With the right and in order maintenance, your wish having a long-lasting espresso maker would never fail. DeLonghi ESAM3300 Magnifica always makes the dream of anyone craving for the out-of-this-world coffee come true. For a superb result, there are two key factors you couldn’t leave out—the right ingredients and process. Pick the high-quality beans and follow the steps carefully based on the instruction guides. Lastly, this resourceful espresso maker is indeed suitable for preparing any coffee-based, be it a cup of appetizing espresso or a mug for cappuccino and latte. Are you in love with the experiment? Just benefit the machine and try the possible array of interesting recipes. Aside from great durability, Magnifica is perfect to prepare many kinds of coffee drinks for your breakfast companion. It’s simple to use, quick, and convenient. Having this truly gives you a lot of advantages, making your life much easier. 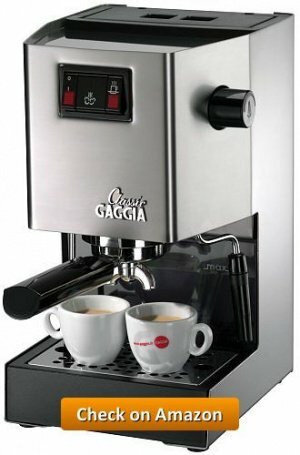 The only disadvantage of Magnifica is the sound generated when you operate it in the following seconds. Somehow, the machine is a bit ear-splitting. Among the best espresso markers 2018, the Magnifica is definitely handy for those of you finding a durable espresso maker as well as a practical reason. What are you waiting for? Go get it soon. Seeking a chic espresso maker that produces a genuine Italian espresso drink? It’s time to own the De’Longhi Lattissima Pro, one of the best espresso machines 2018. The metal stainless object with the input power of 1300 watts literally makes your breakfast and afternoon coffee preparation much easier. Its latest industrial look truly fits with your modern kitchen. The De’Longhi Lattissima Pro does bring the culture of sipping coffee to the upper level. It comes with countless highlights that make anybody drop their jaws. Interestingly, the fresh espresso machine has De’Longi’s automatic cappuccino system patented which plays a role in producing barista style beverage. Not only is your coffee rich in flavor but also foamy, attracting people to go for a taste—all just needs the touch of a button. Meanwhile, the aroma enhances due to the 19 bar pressure pump system. Your tasty morning cappuccino is impeccable, appetizing, and fabulous. The machine’s detachable milk carafe is equipped with the auto-clean function, easing your daily task. To do this, you just need to press the clean button and let the steaming hot water perform its duty in cleansing so that the next use is at hand. This part also helps your latte creation filled with steamed milk galore be so delightful. For the maintenance after use, you might put it in the refrigerator. It doesn’t stop at that, one of the best espresso makers 2018 also holds a spontaneous sensor touch coming with the programmed drink options from hot milk to lungo. The programmable LED touch-screen allows you to adjust the volume setting. Unlike the traditional espresso maker which seems more conventional in the way of a cleaning process, the De’Longhi Lattissima Pro applies Nespresso capsule system letting the cleaning task much more effortless. It really is in accordance with the easy cleanup idea letting everyone fall in love with this hip product. Speaking of the appearance, the Lattissima Pro remains adorable, perfect to revamp your ordinary kitchen to an extraordinary one. The machine’s core body has a touch of brushed aluminum. While the other parts such as the cup stand and the filter of drip tray are comprised of solid material—the chrome metal. Each detail of this remarkable espresso maker truly represents a first-class appliance worth to your spending. It is unquestionable that the De’Longhi Lattissima Pro possesses numerous advantages leaving everybody speechless. The automatic cappuccino system, as well as the Nespresso capsule system, create your coffee and milk-based beverages more perfect; they are balanced, foamy, and importantly luscious. The efficient cleanup is no less important. The machine’s removable milk carafe is automatically able to clean the interior by itself. Additionally, it’s more optimal with the LED touch-screen and pivoting cup support. The only matter is that the users are not able to adjust the warmth level. Unfortunately, based on the unsatisfied feedback, the coffee is a bit hot on the first sip. The Lattissima Pro is obviously apt for coffee and milk enthusiasts. For anyone of you seeking an automatic cleanup machine, opting for this is nothing yet excellent. Seeing its features, it is safe to say that De’Longhi Lattissima Pro is indeed one of the best espresso machines 2018. Are you Lungo addicts who always get distressed without a cup of the short black Italian coffee beverage at breakfast time? Dismiss your trouble with the Nespresso C40-US-TI-NE Inissia, one of the top espresso makers 2018. There are a couple of reasons why you need to get this cutting-edge product. Just check out these following highlights blowing your mind. Could you find the finest argument why your coffee-base drink is tantalizingly aromatic and full-flavored? Say thanks to Nespresso Inissia for all this. Among the best espresso machines 2018, the latest appliance carries numerous advantages making your daily life much easier. Don’t get surprised; your 9 cups of coffee can be made up only with one touch without refilling water. Moreover, the process of allowing the liquid to get a perfect temperature simply needs 25 seconds – it is super quick, isn’t it? Your favored espresso maker really is adjustable, fitting with varied cup sizes. For your prompt breakfast and lunch preparation, pressing the Espresso and Lungo buttons easily programmed is nothing but brilliant. With its high-pressure pump (up to level 19) and not to mention the extraordinary machine’s patented extraction system, you will always find it easy to use. Why you can’t miss out on purchasing this lovely product is its automatic power off. This feature remarkably lets your everyday energy thrift more optimum. After 9 minutes of use, the energy saving mode will do its task by switching off the engine. The handy coffee maker is categorized as an A class in the term of power consumption. What about the Nespresso Inissia’s capsule system? Each machine is equipped with 24-ounce water tank and 16 capsules that deliver matchless aroma and terrific taste you would never imagine before. The capsules are made of aluminum easily recycled and firmly sealed. The Grand Cru allows you to go for your best coffee selection as well as savoring the high-quality hot drink. Every detail of it truly brings the coffee enjoyment into the upper level. The up-to-date coffee machine is like endowed with magical power, fleshing out your day. Highlighting an ergonomic handle, little footprint, and lightweight material, it can be removed anywhere at your home. Its modish look, as well as colorful design, literally matches with your contemporary kitchen. One small cup has never been enough for you? Get the bigger cup and benefit the machine’s folding drip tray. Once you place the mug in the slot, the tray will work automatically. The espresso maker of Nespresso C40-US-TI-NE Inissia is favored by a number of coffee fanatics – it’s trendy, removable, and energy efficient. This machine can turn off the power automatically making your everyday life much simpler. Its quick preheating system is in line with the latest brewing technology. Unfortunately, the machine doesn’t feature great durability. It is not recommended for users looking for the long-term usage. Additionally, there is no wide option regarding espresso pod. Are you seeking a removable, light coffee maker with automatic power off? This Nespresso Inissia, one of the best espresso makers 2018, undoubtedly fixes your need. It’s also great for Lungo lovers. 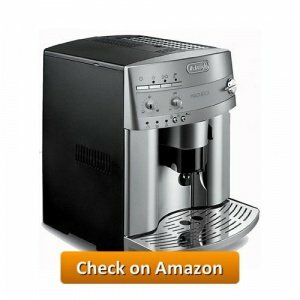 Are you seeking a best seller home espresso machine? Get the Gaggia Classic, one of the best semi-automatic espresso makers 2018 for your fresh kitchen collection. Its authentic old design dating back to the 1990’s always captivates the world’s coffee enthusiasts to own this. Here are the highlights you need to keep in mind. Read on to check them out now. Although Gaggia Classic has a venerable look, its classic impression is undeniably breath-taking. As the carbon steel nickel-plated has been in longer in use, this product will always keep hold of its durability feature. Made up of brushed stainless steel, you will find the comely semi-automatic espresso producer not easy to rust as well as flaking over time. Another reason why you mustn’t skip out this one is its upgraded portafilter handle of which function is to advance the espresso flow’s consistency. There is no difference when it comes to comparing the design of both old and new portafilter. It still retains the chrome-plated brass and commercial size. The 58 mm portafilter, as well as the brew group, creates heat keeping and stability. Gaggia Classic’s spontaneous control literally lightens your morning task up during coffee preparation. Not only is it simple to operate but also flexible. Interestingly, the pressurized filter baskets, 7-gram measuring scoop, and coffee tamper help the baristas from beginner to expert do their job quicker and more expeditious. Using this machine will omit the complicated process of making the frothed milk. Most out of devoted users must agree that it is less fussy and complicated. Besides, you will be absolutely satisfied with the final result. Have you noticed the Gaggia’s up-to-the-minute component? Yes, that’s the pod adaptor. Unlike the old one which needs many attempts to remove and attach, the recent part is truly trouble-free. The coffee machine has an overall power output of 1425 watt and 55 watts for the electric pump. The remaining power is beneficial to the boilers system integrated with two elements of heating. What makes Gaggia Classic out of the ordinary is the heating tool inaccessible to water. Instead of being open, it’s uniquely embedded into the boiler’s sides. This way does help the element keeps away from corrosion. The Gaggia also boasts the 3-way solenoid valve. The main purpose why the manufactory installs this component is to reduce the pressure immediately and shift it to the drip tray. This feature lets your coffee puck drier. This condition is good for the cleaning process as no coffee dregs are left. As one of the best semi-automatic espresso makers 2018, the Gaggia Classic, in fact, brings out numerous advantages. It’s not only handy for frothed milk making but also easy to use. Its commercial brewing group is the key part to stabilize the maximum heat. Meanwhile, the unique boiler makes the boiling process faster. Compared to other espresso machines with a fashionable look, the Gaggia is less attractive. In addition to that, there is no wide variety of drink options you could make. For those of you looking a coffee maker with a stable heating system, this machine is such a great choice. The same is true with the frothed milk lovers. As one of the best semi-automatic espresso makers 2018, Gaggia Classic is definitely an excellent device to have at home. It’s time to add your brand-new kitchen collection with the DeLonghi Dedica 15-Bar Pump, one of the best espresso makers 2018. In comparison to other products, this all the rage appliance is truly special. Not only does it feature the utility goal but also high fashion lifestyle. To see the details, simply read on to check out these following descriptions. Creating the authentic Italian espresso beverage with the full-bodied taste and impressive aroma is much easier with this lovely DeLonghi Dedica 15-Bar Pump espresso machine. It comes with a unique feature called Flow Stop that allows you to pick one to two espresso shots to every cup. 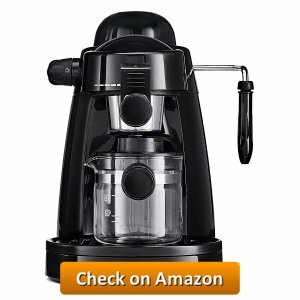 This wonderful machine makes your morning drink preparation much easier. Additionally, it includes the automatic operation. As one of the top espresso makers 2018, it is equipped with the up-to-date Thermoblock technology—within 40 seconds, the water you are going to use for coffee making boils up quickly. The heating system is totally effective and keeps your machine heating component more stable. Arguably, the DeLonghi Dedica 15-Bar Pump lets each step in creating your delicious cappuccino quicker than the ordinary one. Don’t get surprised with the following feature—the manual cappuccino system which has been fully patented. This rewarding method helps the consistency of the foam thicker, richer, and more long-lasting. Thus, your prime beverage for significant occasions such as family gathering and party with friends appears impeccable. Selecting the desired beverage as you want is not a big deal. The ultimate performance of DeLonghi Dedica 15-Bar Pump indeed can’t be disregarded. Why you should favor this handy appliance is due to the control panel, effortless to use. 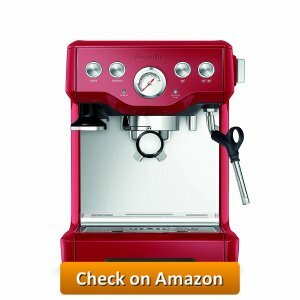 It is outfitted with illuminated buttons, espresso pods easily operated, and not to mention the 3 in 1 filter holder of which function in accommodating the shots from single to double. Speaking of the volume setting, DeLonghi Dedica 15-Bar Pump owns 32-ounce water tank capacity, convenient to an event which requires a big amount of cups. Another feature that makes your jaw drop is no other than the self-priming system. The whole play a key role to ensure the coffee maker is ready for use. What an amazing latest coffee machine! What about the appearance of DeLonghi Dedica 15-Bar Pump? At a glance, it doesn’t only look eye-catching but also modern and upscale as well. The slim 6” design adapts a minimalist idea so that the counter space is easy to set. Although it’s plated with neutral colors from black to silver, this espresso machine represents the state-of-the-art model. The highlights that DeLonghi Dedica 15-Bar Pump own are unquestionable. The Thermoblock technology really shortens the boiling process and makes the heating system more stable. Moreover, this stylish espresso machine also boasts manual cappuccino system, illuminated buttons, and large water tank capacity. Unfortunately, this espresso maker doesn’t have saving energy mode—it would be power consuming. In the term of saving power, you are not recommended to purchase this. The DeLonghi Dedica 15-Bar Pump is apt for those of you looking for a coffee maker with a larger capacity as well as high fashion look. 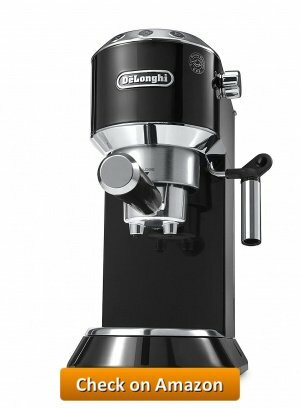 All in all, if you are looking for one of the best espresso makers 2018, DeLonghi Dedica 15-Bar Pump is an excellent choice.